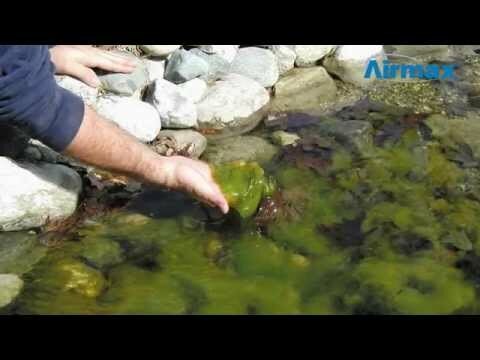 CrystalClear® AlgaeOff® - Airmax® Inc.
CrystalClear® AlgaeOff® utilizes the latest in oxygen technology to remove string algae quickly and efficiently. CrystalClear® AlgaeOff® is an EPA registered, granular algaecide that works in seconds, adds oxygen to the pond, removes odor and is the only water treatment product on the market with a money back guarantee. CrystalClear® AlgaeOff® can be used as needed. For best results use when algae is actively growing. Turn off water pumps and fountains before applying CrystalClear® AlgaeOff®. Apply granulars directly on to damp, infested areas. Let it set for 15-20 minutes before turning on pumps. Remove any debris after treatment and wait at least 48 hours if second treatment is required. For liquid applications, please follow all label instructions. Due to solubility, AlgaeOff® is not as effective with this application method. CrystalClear® AlgaeOff® cannot be shipped to Alaska, Hawaii, Puerto Rico or Canada.